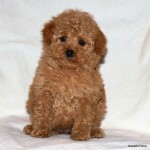 Due next week, Scarlet’s Fancy will be welcoming a new litter of red and apricot Toy and Miniature poodle puppies! If you have been thinking about a new addition to the family, a poodle puppy is a great option. Although they are often thought of as just a pretty face, poodles are smart, active and very obedient dogs. Known for their energy, toy and miniature poodles are great for families with young children. A toy or miniature poodle puppy will not only add some life to your home, but it will get your children outside, playing and enjoying the outdoors, since poodles do need daily exercise. This, as we all know, is becoming more difficult with all the electronic toys on the market these days. In addition to the litters due next week, we are also welcoming two new sires to our breeding stock. All four parents of our new sires are AKC Champions. 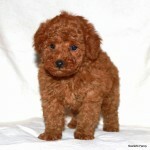 For more information about adding a red or apricot poodle puppy to the family, contact us today at 805-748-2095 or email me at scarletsfancypoodles@gmail.com.